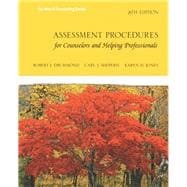 by Drummond, Robert J.; Sheperis, Carl J.; Jones, Karyn D.
Since its first publication in 1988, Assessment Procedures for Counselors and Helping Professionals has become a classic among assessment textbooks designed specifically for aspiring counselors. Now in its Eighth Edition the text includes extensive changes to content and updating throughout, while maintaining its popular, easy-to-read format and continuing emphasis on assessment information that is most useful and relevant for school counselors, marriage and family therapists, mental health counselors, and other helping professionals. Throughout the text, readers learn the essential topics; see clearly how the elements of assessment interact; apply the material to the major instruments used in counseling; reinforce learning through discussion questions and activities; and get invaluable information and examples about widely used assessment instruments in order to become familiar with these well-known tests. Dr. Robert Drummond passed away on March 14, 2005. He was a retired professor and counselor educator at the University of North Florida for 20 years. He was foremost in the field of assessment, and he specialized in educational and psychological testing, career development, models for evaluation, educational research, and personality theory and measurement. Dr. Drummond wrote the First Edition of this text in 1988. Now in its Eighth Edition, the book remains a popular assessment textbook in counseling. Dr. Carl J. Sheperis serves as Chair of the Department of Counseling and Special Populations at Lamar University. He is a Past-President of the Association for Assessment and Research in Counseling, Associate Editor for Quantitative Research for the Journal of Counseling and Development, and a Director for the National Board for Certified Counselors. Practice. In addition to this textbook Dr. Sheperis is an author of: Research in Counseling, Quantitative, Qualitative, and Mixed Methods, Clinical Mental Health Counseling: Fundamentals of Applied Practice, and The Peace Train. He is also published in various textbooks, academic journals, and reference volumes. A frequent speaker and presenter at professional conferences and workshops, as well, Carl Sheperis has appeared at such recent events as the American Counseling Association World Conference, the Association for Counselor Education and Supervision Conference, the National Assessment Conference, and the National Head Start Conference. Dr. Karyn Dayle Jones is an associate professor in counselor education at the University of Central Florida. She has 20 years of experience in the counseling profession and has been a counselor educator for 14 years. Jones is coauthor of Introduction to the Profession of Counseling, has authored or coauthored several book chapters and refereed publications, and has made numerous professional presentations in the field of counseling and counselor education. Her primary areas of research are assessment and diagnosis. She is the past president of the Counseling Association for Humanistic Counseling, Education and Development, a division of the American Counseling Association. Jones is a Florida Licensed Mental Health Counselor, and a National Certified Counselor, and she has worked as a counselor in mental health agencies, schools, and private practice.